The peroxisome proliferator-activated receptor α (PPARα) plays an important role in the metabolism of lipoproteins and fatty acids, and seems to protect against the development of atherosclerosis. 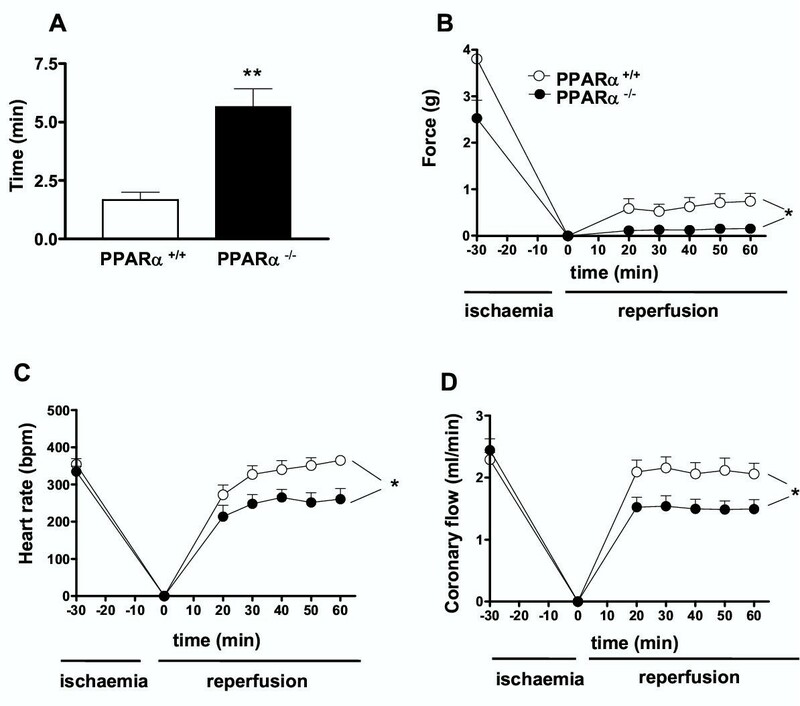 To evaluate the possible protective role of PPARα on cardiovascular function, the effect of the PPARα agonist, fenofibrate was assessed with respect to ischaemia/reperfusion injury and endothelial function in mice. Fenofibrate treatment reduces myocardial infarction size and improves post-ischaemic contractile dysfunction. Hearts from PPARα null mice exhibit increased susceptibility to ischaemic damages and were refractory to protection by fenofibrate treatment suggesting that the beneficial effects of fenofibrate were mediated via PPARα. Furthermore, fenofibrate improves endothelium- and nitric oxide-mediated vasodilatation in aorta and mesenteric vascular bed. A decreased inhibitory effect of reactive oxygen species in the vessel wall accounts for enhanced endothelial vasodilatation. However, the latter cannot be explained by an increase in nitric oxide synthase expression nor by an increase sensitivity of the arteries to nitric oxide. Altogether the present data suggest that fenofibrate exerts cardioprotective effect against ischaemia and improves nitric oxide-mediated response probably by enhancing antioxidant capacity of the vessel wall. These data underscore new therapeutic perspectives for PPARα agonists in ischaemic myocardial injury and in cardiovascular diseases associated with endothelial dysfunction. The peroxisome proliferator-activated receptor α (PPARα) is a member of the nuclear hormone receptor superfamily. PPARα is activated by several fatty acids and is also the molecular target of hypolipidemic fibrates. PPARα plays an important role in the liver, where it controls the metabolism of lipoproteins and fatty acids [1, 2]. In addition, PPARα is widely expressed in the entire cardiovascular system, including the heart and the different cells that compose the vascular wall, such as endothelial, vascular smooth muscle, and monocyte/macrophage cells. Activation of PPARα increases uptake of fatty acids and activates their β-oxidation as a result of the induction of many genes including some coding for lipid binding proteins, apolipoproteins and those involved in peroxisomal and mitochondrial fatty acid β-oxidation [2–4]. Fatty acid β-oxidation seems to play a critical role not only in normal cardiac metabolic homeostasis but its dysregulation also contributes to the pathogenesis of a variety of disease states such as cardiac hypertrophy and heart failure. Recent studies have suggested that PPARα agonists, in addition to their beneficial effects on lipid homeostasis, might reduce the progression of atherosclerotic lesions by a direct anti-atherogenic and anti-inflammatory action . Indeed, PPARα activation results in the induction of antioxidant enzymes and in the inhibition of the expression of pro-inflammatory genes, such as interleukin-6, cyclo-oxygenase 2, and endothelin within vascular cells via negative regulation of signalling pathways, controlled by the nuclear factor κb (NFκB) and the activator protein-1 (AP-1). Furthermore, PPARα inhibits the expression of monocyte-recruiting proteins, such as vascular cell adhesion molecules , induces apoptosis in monocyte-derived macrophages , and reduces tissue factor expression and activity in monocytes [8, 9], accounting for the reduction of the thrombogenicity of atherosclerotic lesions. We analyzed here the effect of the PPARα agonist, fenofibrate on the regulation of cardiovascular function with respect to ischaemia-reperfusion myocardial injury and endothelial dysfunction. Evidence is provided that treatment of mice with fenofibrate via PPARα reduces myocardial infarction size and improves post-ischaemic contractile dysfunction, after an ischaemic period. 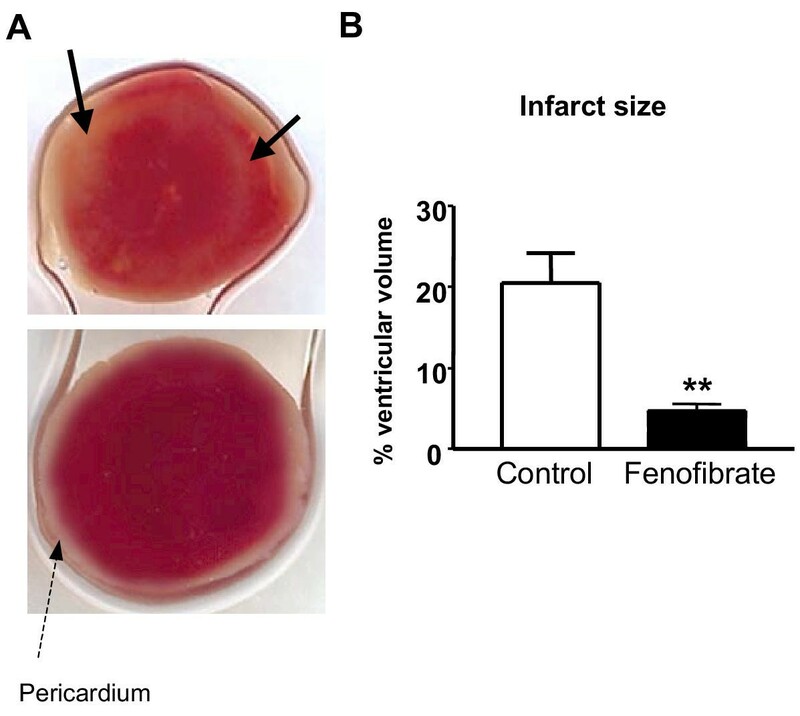 Furthermore, we demonstrate that fenofibrate improves endothelial nitric oxide (NO)-mediated vasodilatation by increasing the antioxidant defense system of the vessel wall. Administration of the PPARα agonist, fenofibrate, for 10 days to male C57BL/6 mice resulted in a significant decrease in body weight as compared to control mice treated with placebo (Control: 30.1 ± 0.26, n = 21; Fenofibrate: 26.8 ± 0.47, n = 19, P < 0.001). At the end of the treatment period, hearts from fenofibrate-treated mice weighed significantly less than those from control mice (Control: 0.135 ± 0.003 g, n = 9; Fenofibrate: 0.113 ± 0.05 g, n = 8; P < 0.05). However the heart/body weight ratio was not altered after fenofibrate treatment (Control: 0.48 ± 0.006 %, n = 9; Fenofibrate: 0.46 ± 0.11%, n = 8). To analyze the effects of PPARα activation on myocardial infarction, hearts were subjected to 30 min global, no-flow ischaemia at 37°C, followed by 1 h reperfusion. Myocardial infarct size was evaluated morphologically using TTC-staining as an index of irreversible myocardial injury (Fig. 1A). Fenofibrate treatment significantly reduced ischaemia-induced myocardial infarction size by more than 3-fold relative to control mice (P < 0.01) (Fig. 1B). 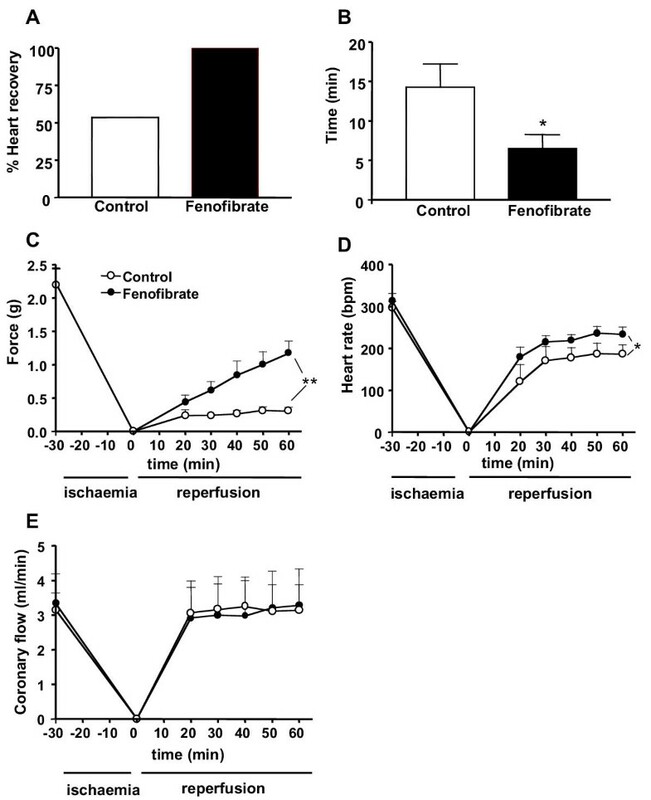 To determine whether treatment of mice with fenofibrate protects against ischaemia/reperfusion-induced functional injury, ventricular parameters such as developed force, heart rate, and coronary flow were studied in control and fenofibrate-treated animals. Basal parameters were not significantly different between the two groups of mice at the end of the equilibration period before ischaemia as (Table 1). After the ischaemic insult, all the hearts from fenofibrate-treated mice recovered both contractile force and heart rate whereas only 58% of the hearts in control mice showed an improvement (Fig. 2A). For the following measured parameters, only the values of heart that recovered for the ischaemic insult have been included. Also the time of recovery of force and heart rate after the ischaemia was significantly shorter in hearts from fenofibrate-treated as compared to control mice (Fig. 2B). Recovery of contractile force in hearts from control group was stabilized after 20 min reperfusion (Fig. 2C). The level of the contractile force recovered was, however, very low (i.e. 13%), when compared with the contractile force measured before the induction of the ischaemia. By contrast in hearts from fenofibrate-treated mice, the recovery in cardiac contractile force was dramatically enhanced (60 % of the initial force), and did not yet reach maximal values 1 h after reperfusion. Thus at the end of the reperfusion period, the developed force was significantly greater in fenofibrate-treated mice than in control mice. Heart rate recovered rather quickly and reached a steady state level 30 min after reperfusion in both groups of mice. The level of heart rate recovery was, however, significantly higher in fenofibrate-treated mice when compared to that of control mice (Fig. 2D). The coronary flow rate returned after 20 min of reperfusion to its initial value before the ischaemic condition in the two groups of animals and it remained stable until the end of the reperfusion period (Fig. 2E). Altogether, these data suggest that fenofibrate treatment markedly improves myocardial contractile function following ischaemia/reperfusion. Fenofibrate improves the post-ischaemic recovery of cardiac function. Percentage of hearts that recover after ischaemic condition (A), time of recovery (B) and postischaemic recovery of force (C), heart rate (D), and coronary blood flow (E) in hearts from control and fenofibrate-treated mice. Data are the mean ± SEM of 7–10 experiments. * P < 0.05, ** P < 0.01. Ventricular functional parameters measured before ischaemia in control and fenofibrate-treated mice. To test the role of PPARα, ischaemia/reperfusion-induced functional injury was conducted in hearts from both PPARα+/+ and PPARα-/- mice. After the ischaemic insult, the percentage of hearts recovered from both contractile force and heart rate were not different between PPARα+/+ and PPARα-/- mice being 75% versus 87% respectively. However, the time of recovery of force and heart rate after the ischaemia was significantly shorter in hearts from PPARα+/+ as compared to hearts from PPARα-/- mice (Fig. 3A). Recovery of contractile force in hearts from control group was stabilized after 20 min reperfusion (Fig. 3B). The level of the contractile force recovered was, however, very low (i.e. 22%), when compared with the contractile force measured before the induction of the ischaemia. Interestingly in hearts from PPARα-/- mice, the recovery in cardiac contractile force was dramatically decreased (8 % of the initial force), and did not improve 1 h after reperfusion. Thus at the end of the reperfusion period, the developed force was significantly lower in hearts from PPARα-/- than in those from PPARα+/+ mice. Heart rate recovered rather quickly and reached a steady state level 30 min after reperfusion in both groups of mice. The level of heart rate recovery was, however, significantly higher in heart from PPARα+/+ mice when compared to that of PPARα-/- mice (Fig. 3C). The coronary flow rate returned after 20 min of reperfusion to its initial value before the ischaemic condition in PPARα+/+ mice and it remained stable until the end of the reperfusion period (Fig. 3D). In PPARα-/- mice, the coronary flow did not returned to its initial values (i.e. 60%). Furthermore, the level of coronary flow recovery in PPARα-/- mice was significantly lower than the level obtained in heart from PPARα+/+ mice. Hearts from PPARα-/- mice were more susceptible to post-ischaemic damages than those from PPARα+/+ mice. Time of recovery (A) and post-ischaemic recovery of force (B), heart rate (C), and coronary blood flow (D) in hearts from PPARα+/+ and PPARα-/- mice. Data are the mean ± SEM of 6 experiments. * P < 0.05, ** P < 0.01. Finally, to test whether the protective effect of fenofibrate treatment against ischaemia/reperfusion-induced functional injury was due to PPARα activation, experiments were carried out in heart from mice lacking PPARα treated with fenofibrate. Interestingly, no beneficial effect of fenofibrate on PPARα-/- mice was observed and in fact 5 out of 6 hearts were dead after ischaemia. Altogether, these data suggest that hearts from PPARα-/- mice were more susceptible to myocardial dysfunctions following ischaemia/reperfusion than those from PPARα+/+ mice. In addition, the beneficial effects of fenofibrate treatment on myocardial functions following ischaemia reperfusion were lost and even worsened in PPARα-/- mice leading us to conclude that this effect was mediated through PPARα. The hypothesis that nitric oxide (NO) may play a role in the fenofibrate treatment-induced cardioprotection was also tested by analyzing the expression of endothelial NO synthase (eNOS) in hearts taken from either control or fenofibrate treated mice. Western blot analysis showed that fenofibrate treatment did not modify eNOS protein expression in the heart (Fig. 4A). Likewise, fenofibrate treatment did not affect the expression of the RNA of the antioxidant genes Cu-Zn superoxide dismutase (Cu-Zn SOD) or catalase (Fig. 4B,4C). Fenofibrate does not modified eNOS, catalase or Cu-Zn SOD expresion in the heart. Representative Western-blot (A) of eNOS protein expression in hearts from control mice (CON) or mice treated with fenofibrate (FF). Positive control (C) is the eNOS from bovine endothelial cells. Similar results were obtained in three separate experiments. Effect of fenofibrate on catalase and Cu-Zn SOD mRNA expressions in heart (B). Expression of catalase mRNA, Cu-Zn SOD mRNA and the human acidic ribosomal phosphoprotein 36B4. We next analyzed contractile responses in the aorta and in the mesenteric vascular bed. In mesenteric vascular bed, no significant differences in the changes in perfusion pressure produced by the vasoconstrictor agonist, phenylephrine were observed between control and fenofibrate-treated mice (Table 2). Likewise, neurogenic vasoconstriction of the mesenteric bed produced by electrical stimulation was not different between the two groups of mice. In the aorta, the thromboxane A2 analogue, U46619, produced a concentration-dependent contraction that was not different between both groups of animals. This led us to conclude that fenofibrate treatment did not modify the contractile responses to vasoconstrictor agonists or to electrical stimulation in the two vascular preparations studies, mesenteric bed and the aorta (Table 2). Maximal effect (Emax) and EC50 values for phenylephrine- and electrical stimulation induced increases in perfusion pressure in mesenteric bed and for U46619-induced contraction in aorta from control and fenofibrate-treated mice. In the aorta, the NO-synthase inhibitor, L-NAME (300 μM) was without effect on U46619-induced contraction in aorta rings from control mice (Fig. 5A), whereas it significantly enhanced the sensitivity of the vasoconstrictor agonist in aortas taken from fenofibrate-treated mice (Fig. 5B). Fenofibrate enhances the participation of NO in modulating vasoconstriction. Concentration-effect curves for U46619-induced vasoconstriction obtained in thoracic aorta rings of control (A) and fenofibrate-treated (B) mice in the absence or presence of Nw-nitro-L-arginine methyl ester (L-NAME, 300 μM). Data are the mean ± SEM of 6–7 experiments. *P < 0.05. The hypothesis that fenofibrate treatment improves endothelial function was tested next by looking at the endothelium-dependent relaxation to acetylcholine both in the aorta and the mesenteric vascular bed. Interestingly, both the mesenteric vascular bed (Fig. 6A) and the aorta (Fig. 6B) from mice treated with fenofibrate displayed enhanced endothelium-dependent relaxation to acetylcholine, as compared to vascular preparations from control mice. Fenofibrate improves endothelial function. Acetylcholine-induced relaxation in mesenteric bed (A) and thoracic aorta (B). Results were expressed as a percent of the initial phenylephrine- or U46619-induced pre-contraction level. The values of contraction obtained with phenylephrine (10 μM) in mesenteric bed from control and fenofibrate-treated mice were 10.8 ± 1.1 mmHg (n = 9) and 11.44 ± 1.5 mmHg (n = 9), respectively. The values of contraction obtained with U46619 (30 nM) in aorta from control and fenofibrate-treated mice were 3.26 ± 0.2 mN/mm (n = 8) and 3.01 ± 0.2 mN/mm (n = 8) respectively. Data are the mean ± SEM of 8–9 experiments. * P < 0.05, ** P < 0.01. 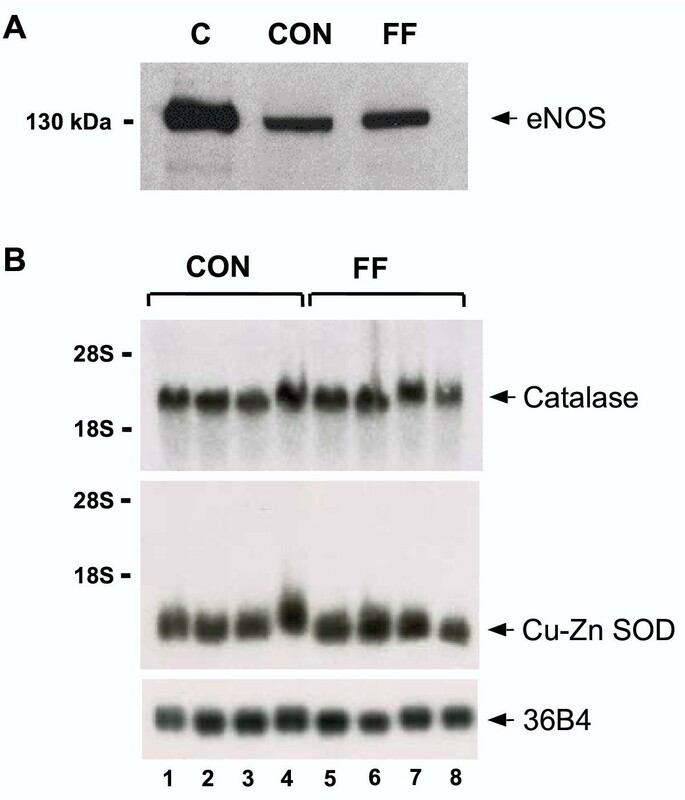 Representative Western-blot of endothelial NO-synthase (eNOS) protein expression in mesenteric bed (C) and thoracic aortic segments (D) from control (CON) and fenofibrate-treated (FF) mice. Positive control (C) is the eNOS from bovine endothelial cells. Similar results were obtained in three separate experiments. The common endothelial factor released by the two vascular preparations is NO. Therefore, we investigated whether the improvement of acetylcholine-induced relaxation in vessels from fenofibrate treated animals could be explained by an enhanced participation of endothelial NO. Western blot analysis showed that eNOS protein expression was not modified by the fenofibrate treatment both in the mesenteric vascular bed and in the aorta (Fig. 6C,B,D), suggesting that the enhanced relaxation to acetylcholine cannot be attributed to an increased expression of eNOS protein in the two vascular preparations. Relaxation in response to the NO-donor, SNAP, was hence studied in both the mesenteric bed and the aorta, in order to test the hypothesis of an increased response to NO or decreased of NO breakdown by reactive oxygen species. In the two vascular preparations from fenofibrate-treated mice, SNAP-mediated relaxation was significantly greater than the relaxation obtained in vessels from control mice (Fig. 7A,B). Interestingly, the combined addition of the superoxide anion and the hydrogen peroxide scavengers, SOD (200 U/ml) and catalase (750 U/ml) increased relaxation to SNAP in the aorta taken from control, but not in that from fenofibrate-treated mice (Fig. 7C). The resulting concentration-response curves to SNAP were hence not significantly different in the aorta from the two groups of mice in the presence of reactive oxygen scavengers. These data suggest that the antioxidant capacity of aortic wall from fenofibrate-treated mice was already sufficiently high. In contrast to the situation in the controls, supplementation with reactive oxygen scavengers (SOD and catalase) could not further enhance the protection against NO breakdown and the relaxation to SNAP. Increased antioxidant capacity of the vessel wall from fenofibrate-treated mice was not associated with an increased expression of mRNA for Cu-Zn SOD or catalase in the aorta and mesenteric bed (data not shown). Fenofibrate increases anti-oxidant capacity of the vessel wall. Concentration-effect curves to the NO-donor S-N-acetylpenicillamine (SNAP) obtained in mesenteric bed (A) and thoracic aorta rings (B). Concentration-effect curves to SNAP obtained in aorta rings in the presence (C) of superoxide dismutase (SOD, 200 U/ml) plus catalase (750 U/ml). Results were expressed as a percent of the initial U46619-induced precontraction level. The values of contraction obtained with U46619 (0.3 μM for mesenteric bed and 30 nM for aorta) were 22.4 ± 5.6 mmHg (n = 5) and 28 ± 4.9 mmHg (n = 6) in mesenteric bed and 3.55 ± 0.15 mN/mm (n = 7) and 3,37 ± 0.2 mN/mm (n = 6) in aorta from control and fenofibrate-treated mice, respectively. Pretreatment with SOD and catalase did not affect contractile responses to U46619 (data not shown). Data are the mean ± SEM of 5–7 experiments. * P < 0.05, ** P < 0.01. In the present study, we demonstrate that fenofibrate treatment reduces the size of the myocardial infarction and improves post-ischaemic contractile dysfunction. This effect of fenofibrate is mediated via PPARα activation. In addition we report that fenofibrate improves endothelial NO-mediated vasodilatation both in the aorta (conductance vessel) and in the mesenteric vascular bed (which contains small arteries that participate actively in the regulation of peripheral resistance and thus blood pressure). Increased anti-oxidant capacity of the vessel wall, but not increased eNOS expression or increased sensitivity to NO of the vascular smooth muscle accounts for this enhancement of endothelial vasodilatation. The function of PPARα in the heart with respect to cardioprotection against severe ischaemia has not yet been documented. Here, we provide evidence that fenofibrate treatment reduces the infarct size after ischaemia. Furthermore, fenofibrate treatment shortened the time of recovery of the heart after an ischaemic insult and increased the percentage of heart that recovered from ischaemia. Moreover, fenofibrate treatment markedly improved contractile function. It should be noted that fenofibrate treatment did not produce any beneficial effect in heart from PPARα-/- mice. Finally, heart from PPARα-/- mice displayed increased susceptibility to ischaemia/reperfusion-induced functional injury versus those from PPARα+/+ mice. Altogether these results show that fenofibrate through the activation of PPARα exerts a cardio-protective effect. The mechanisms that may explain these effects of fenofibrate are not fully understood. In the heart, PPARα has been reported to regulate cardiac lipid and energy metabolism, by controlling genes encoding the mitochondrial fatty acid β-oxidation pathway, which provides the major source of energy under the form of ATP to the heart muscles . The use of PPARα-/- mice has provided evidence for the role of PPARα in the control of cardiac lipid utilization. Although PPARα-/- mice appear normal under basal conditions, the constitutive expression of protein and enzymes involved in fatty acid transport and metabolism are all significantly lower in heart and liver compared to age matched control [10–14]. The reduction in fatty acid transport and metabolism may hence explain the increased accumulation of lipid, the decreased energy consumption, and the reduction ATP content in hearts from PPARα-/- mice. These above reports are supported by our data showing that hearts from PPARα-/- mice were more susceptible to ischaemic insults when compared to those from PPARα+/+ animals. Indeed, the levels of post-ischaemic recovery of contractile force, heart rate and coronary flow were lower in hearts from PPARα-/-versus PPARα+/+ mice. In mice in which PPARα gene is valid, PPARα agonists such as fenofibrate would favour the maintenance of adequate energy levels, to protect against the fall in ATP during ischaemia by increasing the expression of genes involved in fatty acid utilization, and therefore the content of ATP. This may explain the improved survival of cardiomyocytes and their resistance to ischaemia, as well as the preservation of cardiac contractile function. Most of ischaemia-reperfusion injury is ultimately due to a burst of reactive oxygen species that occurs upon readmission of oxygen [15, 16]. One of the potential mechanisms, which contribute to protection against ischaemia-reperfusion damage by fenofibrate, may be an increase in the antioxidant capacity of the heart due to the induction of antioxidant enzymes. Indeed, under certain conditions, activation of PPARα in vivo has been reported to cause an induction of mRNA and protein levels of antioxidant enzymes, such as catalase, Cu-Zn SOD, and mediators of glutathione pathway [5, 17, 18] which may be able to counterbalance, at least partly, the deleterious effects of oxidative stress during the reperfusion. In the present study, no increased expression of Cu-Zn SOD or catalase mRNA was observed within the heart. Finally, PPARα activation decreases inflammatory gene response by inhibiting NFκB and AP-1 activity, and by establishing a new redox balance caused by oxidant stress-related disease states [5, 17, 18]. The later would be responsible for the increase in defence mechanisms towards the myocardial infarction and reduced myocardial effects of ischaemia. PPARα has also been identified in different vascular cell types including endothelial, smooth muscle cells and monocyte/macrophages [3, 19]. There is growing evidence that the effect of PPARα activation may not solely be restricted to an improvement in the atherogenic lipoprotein profile, but may also be caused by a direct beneficial effect on vessel wall . The early stages of atherosclerosis may result from an insult to the endothelium, a reduction in the production of protective and relaxant factors (i.e. NO, prostacyclin or endothelium-dependent hyperpolarizing factor), or both factors combined. This may consequently induce other changes, such as the expression of adhesion molecules, the reduction of barrier function, and the uptake of lipoproteins into the sub-endothelial matrix. Although inhibition of NFκB and AP-1 could limit the secretion of endothelin-1 by endothelial cells or reduce vascular cell adhesion molecule-1 expression, no direct studies have looked at the beneficial effect of fenofibrate treatment on endothelial function. In the present study, we demonstrated that fenofibrate treatment improved acetylcholine-induced relaxation in the aorta and in the mesenteric vascular bed with regard to endothelium-dependent vasodilatation. A reduced contractility of the vessels to vasoconstrictor agonists cannot account for the enhanced relaxation, because the levels of pre-contractions were matched between vascular beds from either control or fenofibrate-treated mice. Furthermore, fenofibrate treatment did not affect the response elicited by nerve stimulation nor that produced by the alpha1-adrenoceptor agonist, phenylephrine at least in the mesenteric bed. 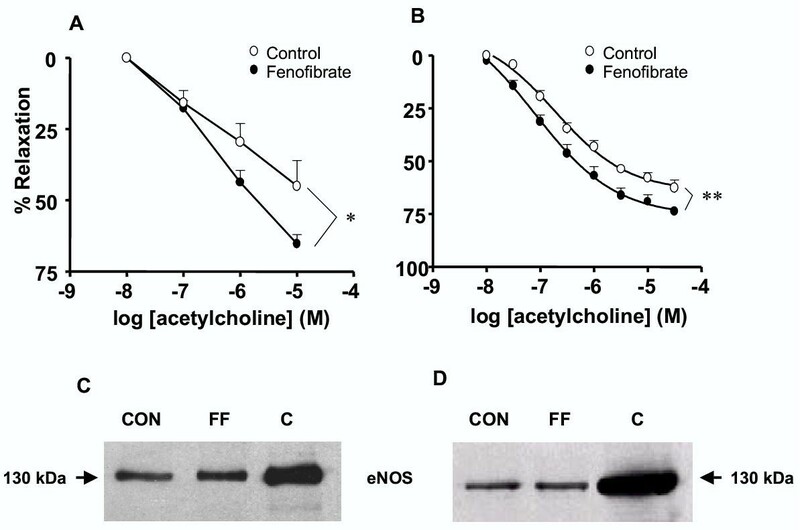 Interestingly, the use of the NO synthase inhibitor unmasked the enhanced participation of NO in the regulation of vasoconstrictor activity in the aorta from fenofibrate-treated mice. The most relevant hypothesis to explain the enhanced relaxation to acetylcholine upon fenofibrate treatment might be an increase in either generation (i.e. synthesis or release) of, or response to endothelial relaxant factors. Alternatively, an alteration in the balance between endothelial relaxing and constricting factors can be invoked. One of the major endothelial vasodilator factor and which is also common to the two vascular preparations studied (i.e., aorta and mesenteric bed) is NO, the reduced participation of which has been implicated in diseases linked to endothelial dysfunction . Furthermore, NO has been shown to inhibit platelet aggregation , to limit the flux of the atherogenic plasma proteins into the artery walls  and in the longer term, to induce the expression of genes protective to the cardiovascular system . Fenofibrate-induced increased participation of endothelial NO cannot be attributed to an increased expression of the eNOS protein, both in aorta and mesenteric bed, even though an increased enzymatic activity cannot be fully ruled out. The increased relaxation to acetylcholine may, however, result from an increased sensitivity of the smooth muscle cell to NO, as shown by the improvement of the vasodilator effect of the NO donor, SNAP, in vessels taken from fenofibrate-treated mice. It is interesting to note that the superoxide anion scavengers, SOD and catalase, were able to potentiate the effect of SNAP-induced relaxation in the aorta from control mice, but not in those from fenofibrate-treated mice. Thus, the vasodilatory response to the NO donor was not different in the two groups after blockade of superoxide anion production. This would imply that the antioxidant capacity of the aortic wall from fenofibrate-treated mice was sufficiently high, that the supplementation with reactive oxygen scavengers could not produce any further protection against NO breakdown nor a further increase in relaxation to SNAP. Therefore, the most and parsimonious hypothesis to explain the enhanced endothelium-dependent relaxation to acetylcholine after fenofibrate treatment is an increased antioxidant defence of the vessel wall, that preserves endothelial NO from breakdown by the superoxide anions. Up-regulation of mediators of the glutathione pathway [5, 17, 18] or down regulation of the superoxide generating enzyme, NADPH oxidase  might account for the effect fenofibrate since we did not observe any changes in the expression of Cu-Zn SOD or catalase in the aorta and the mesenteric bed. In conclusion, the present study proves that treatment with the PPARα agonist, fenofibrate, has protective effects against myocardial infarction induced by severe ischaemia and significantly improves endothelial vasodilatation. All the above effects of PPARα agonists open new therapeutic perspectives for such compounds in ischaemic myocardial injury and in cardiovascular diseases associated with endothelial dysfunction, secondary to pro-inflammatory or oxidant stress-related disease states. All animal experimentation was performed in accordance with institutional guidelines, and protocols were approved by the French Animal Care Comittee in accordance with European regulations. This study was performed in male adult mice (C57BL/6 strain, 13–15 week-old). Mice were housed at 20°C with a 12 h light cycle, and allowed free access to food and water. One group of animals (control) received placebo and the second received during 10 days, fenofibrate mixed in the food at 0.5 % w/w (15 mg/day) . The dose used is in the range of that commonly reported in mice in which no toxic effect of fenofibrate has been observed as assessed by alteration in body weight at least in PPARα+/+ mice [2, 25–27]. To test whether the effect of fenofibrate was due to activation of PPARα, a group of PPARα-/- mice (25% C57BL/6, 75% SV-129) also received fenofibrate for 10 days. To further study the role of PPARα, on ischaemic insult, comparisons were made between PPARα+/+versus PPARα-/- mice (25% C57BL/6, 75% SV-129). Prior to experimentation, mice were anaesthetised with ketamine (100 mg/kg i.p. ), medetomidine (50 μg/kg i.p.) and heparinized (500 U/kg i.p). The heart was excised, cannulated and perfused according to Langendorffat 37°C and pH 7.4 with Krebs-Henseleit solution containing (mM) NaCl 118, NaHCO3 24, KCl 4, MgCl2 1.2, NaH2PO4 1, CaCl2 2.5, Na2EDTA 0.5 and glucose 10, gassed with 95%O2/5% CO2. Perfusion pressure was constant and equivalent to 80 cm H2O. The heart was stretched to a force of 1 g. The preparation was equilibrated for 30 min, then subjected to 30 min global no-flow ischaemia at 37°C. After the ischaemic insult followed by 1 h reperfusion, hearts were stored at -20°C during 24 h. After this period, the hearts were sliced transversally (2 mm thickness) and incubated at 37°C with TTC for 15 min. Slices were then fixed with 10% formalin for 20 min. After scanning the slice, measurements of stained and unstained TTC areas of the hearts were carried out by the use of a planimeter. The infarct size was calculated as a percentage of the total ventricular volume minus cavities. Mechanical activity of hearts from control and fenobibrate-treated mice were studied at baseline condition and during 60 min reperfusion following 30 min ischaemia. Cardiac parameters were monitored continuously and included cardiac developed force (g), heart rate (beats/min) and coronary flow (ml/min). The mesenteric bed was perfused via the main mesenteric artery with physiological salt solution (PSS) with the following composition in mM: NaCl 119; KCl 4.7; KH2PO4 0.4; NaHCO3 15; MgSO4 1.17; CaCl2 2.5 and glucose 5.5, and was mounted in a perfusion system. Flow rate was adjusted at 2 ml/min with PSS maintained at 37°C and continuously gassed with 95%O2/5%CO2 (pH 7.4). Agonists were administered intraluminally. Changes in perfusion pressure (ΔP, mmHg) were measured with a pressure transducer and recorded by a physiograph. Concentration-response curves to the vasodilator agents acetylcholine or the NO donor, S-nitroso-N-acetylpenicillamine (SNAP; Sigma, Grenoble, France) were performed on mesenteric bed pre-contracted with either phenylephrine or the thromboxane A2 analogue 9,11-dideoxy-9α,11α-methanoepoxy Prostaglandin F2α (U46619; Cayman Chemical Company, USA). Also, concentration-response curves to phenylephrine were constructed. Finally, the mesenteric bed was subjected to nerve stimulation using a tungsten bipolar electrode. Rectangular pulses (0.2 ms, 100 mA) were applied at 7 min intervals for 10 s at various frequencies (5, 10, 15 and 20 Hz). Segments of 2 mm of intact aorta were mounted on a wire myograph  filled with PSS continuously kept at 37°C and gassed with 95% O2/5%CO2 (pH 7.4) and mechanical activity was recorded isometrically. Concentration-response curves were constructed by cumulative application of U46619 in the absence or in the presence of the NO-synthase inhibitor, Nω nitro-L-arginine methyl ester (L-NAME, 300 μM). In another set of experiments, endothelium-dependent relaxation to acetylcholine (0.01–100 μM) or endothelium-independent relaxation to the exogenous NO-donor, SNAP (0.01–100 μM) were examined in vessels pre-contracted with U46619. Concentration-response curves to SNAP were also constructed in the absence or in the presence of the superoxide anion and the hydrogen peroxide scavengers, superoxide dismutase (SOD, 200 U/ml) and catalase (750 U/ml). The inhibitors were added into the bath 25 min prior to the pre-contraction with U46619. Cytosolic proteins either from heart, mesenteric bed or aorta were subjected to SDS-PAGE using 7% gels. After electrophoresis, proteins were transferred to nitrocellulose membranes and were probed with a monoclonal mouse anti-endothelial NO-synthase (eNOS) antibody (Transduction Laboratories, Montluçon, France). Bound antibodies were detected with a secondary peroxidase-conjugated anti-mouse antibody (Bio-Rad, Ivry sur Seine, France). The bands were visualized using the enhanced chemiluminescence system (ECL, Amersham, Buckinghamshire, UK) and quantified by densitometry. RNA preparation, northern blotting and quantification of total cellular RNA derived from heart, aorta and mesenteric bed were performed as described previously . Blots of heart tissues were hybridized with 32P-labeled cDNAs corresponding to full length mouse Cu-Zn SOD (GenBank Accession Number X06683) and mouse catalase (GenBank Accession Number L25069, nt 1109–1504). The human acidic ribosomal phosphoprotein 36B4 probe was used as a marker for equal loading . Reverse transcription of RNA was performed at 37°C for 1 h using M-MLV reverse transcriptase (Life Technologies) and oligo dT, followed by a 15 min inactivation at 70°C. Quantification of aortic and mesenteric bed mRNA for Cu-Zn SOD and catalase was carried out by real time PCR using a LightCycler and the DNA double-stranded specific SYBR Green I dye for detection (Roche, Basel, Switzerland). All results are expressed as mean ± SEM of n experiments, n representing the number of mice. The sensitivities to vasoconstrictor agonists are expressed as EC50 values which represent the half maximally effective molar concentration. Statistical evaluation was carried out using two-way analysis of variance (ANOVA) or unpaired Student's t-test. The level of significance was P < 0.05. Antonia Tabernero was supported by the "Fondation pour la Recherche Médicale". This work was supported by "Fonds de Recherche Hoechst Marion Roussel (GIP HMR)": Exploration Fonctionnelle et Analyse Globale de l'Expression des Gènes. The authors would like to thank Dr Gonzalez F.J for providing the PPAR alpha knock out mice (Mol. Cell. Biol. 15: 3012-3022, 1995). AT carried out organ bath and Western blot experiments, and participated in the design of the study. KS carried out RTPCR experiments, and participated in the design of the study. LJ and IC carried out organ bath experiments (heart and blood vessels). JA participated in the design of the study and in the redaction of the manuscript. RA conceived of the study, and participated in its design, redaction and coordination.